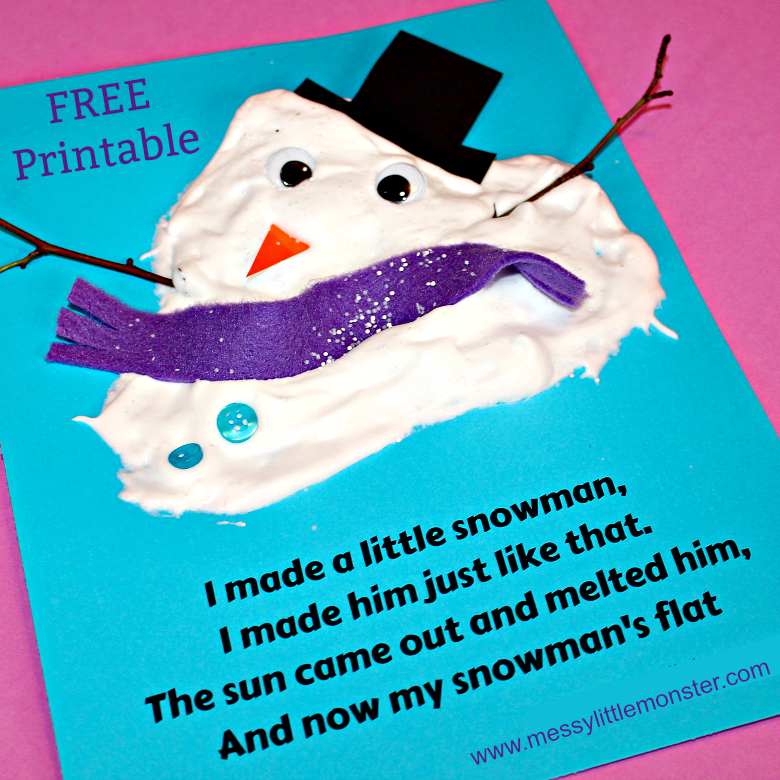 We have an adorable melted snowman craft with a printable poem to share today. Kids can create their own melted snowman art using our easy puffy paint recipe that uses just shaving foam and glue. 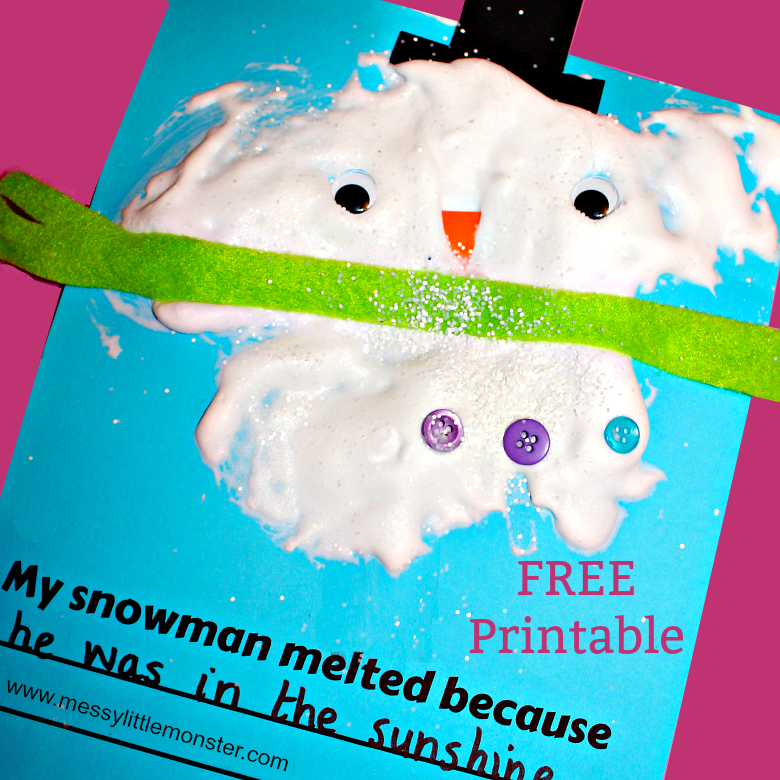 This puffy paint melting snowman craft is perfect for toddlers and preschoolers. However the puffy paint and snowman accessories are arranged on the page you will end up with the perfect melted snowman. 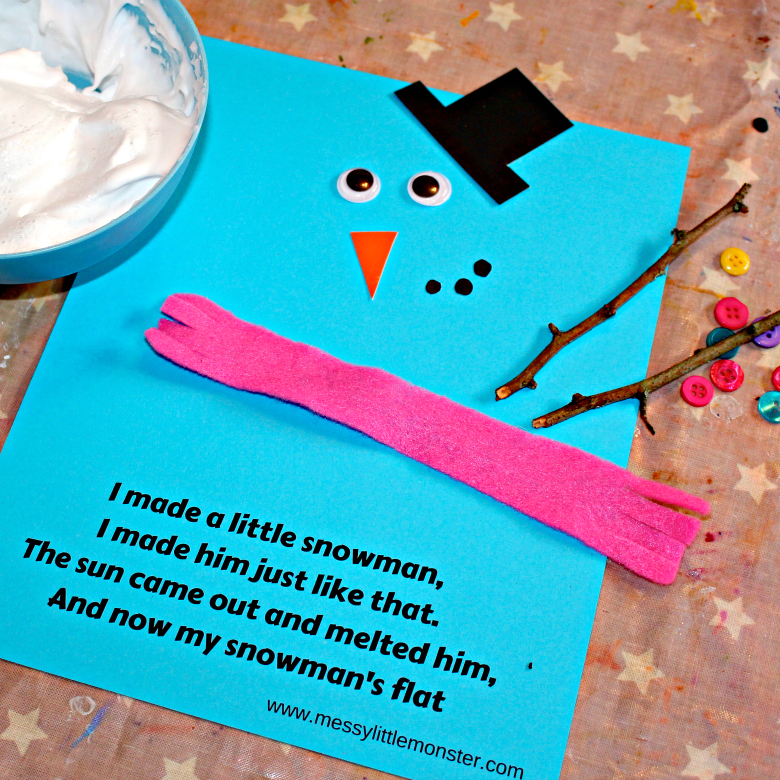 You will love the adorable melted snowman poem that goes with this winter craft! We love using puffy paint! Take a look at the puffy paint snowmen we created last year. Daisy was 2 years old when she made her last melted snowman, so you can see how easy and how much fun it is even for toddlers. If you currently have snow and you are looking for more snow themed projects we have a whole list of snow crafts for kids for you to take a look at. 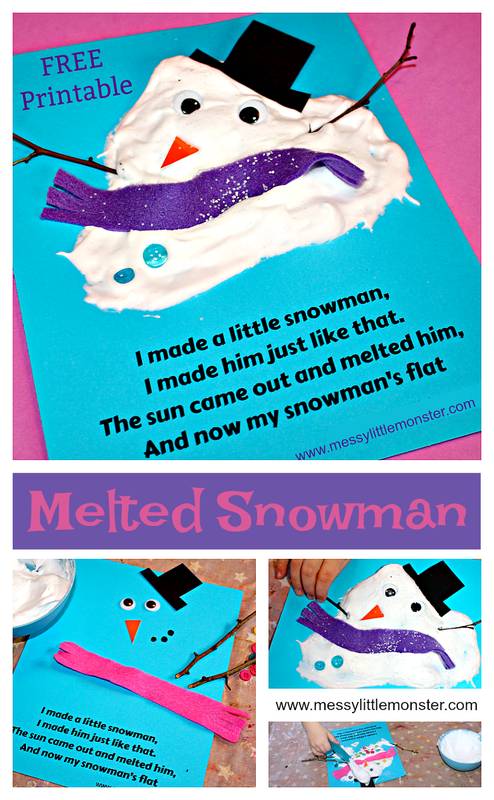 We have another melting snowman craft that you might also like, this time a little less messy! 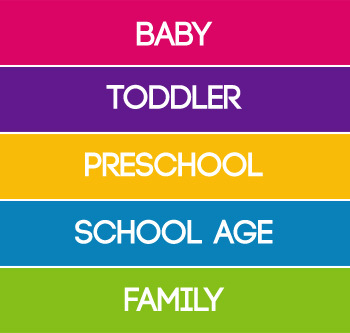 We love combining books and crafts so we have created a list of 20 winter books for kids. I would recommend printing the poem out onto blue card to create a nice contrast between the card and the melted snowman. And now my snowman's flat. 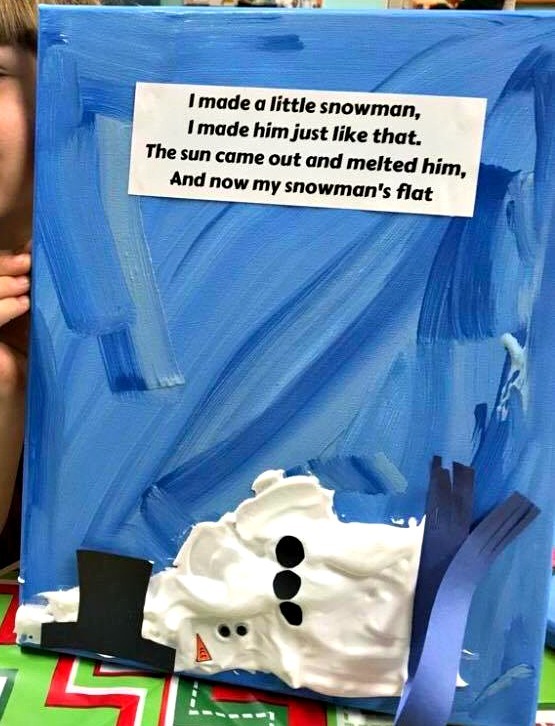 After reading the cute poem have fun painting your own melted snowman. You could use white paint and glue on any snowman accessories, but we love using puffy paint! 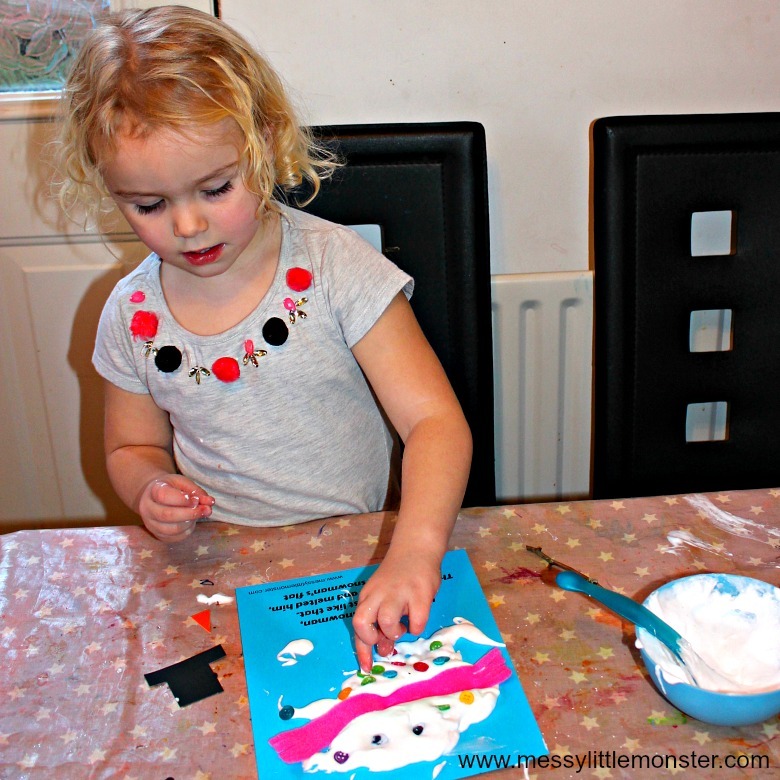 To make snow puffy paint mix together shaving foam and white PVA school glue in a bowl. You will need roughly a 1:1 ratio of glue and shaving foam. You don't really need to measure it though, you can get away with slightly more shaving foam than glue. You might want to sprinkle a little sparkly snow glitter on top too! Cut out a snowman hat from black card, carrot nose from orange card and a scarf from scraps of craft felt or material. You will also need googly eyes, buttons and to collect some small twigs from the garden. 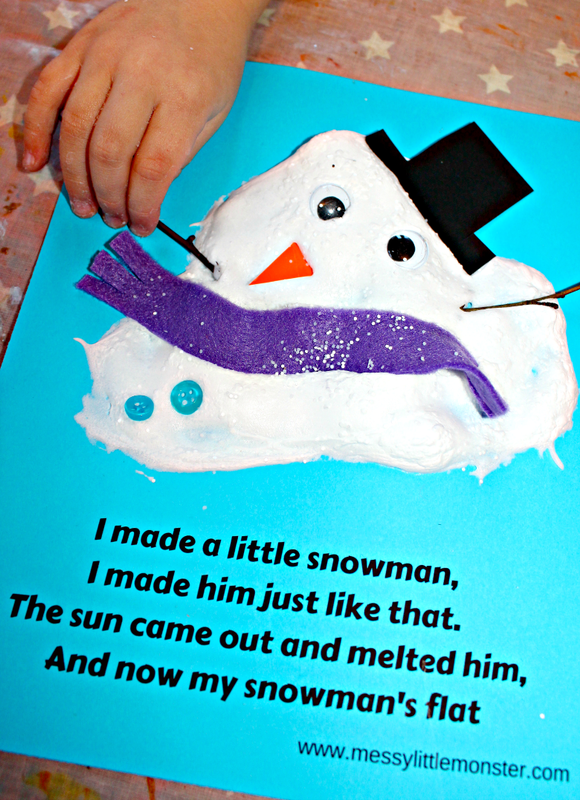 Spoon the puffy paint onto the blue card above the melted snowman poem. The thicker you spoon on the puffy paint the more 3D it will look once dry. Place all the snowman accessories onto the puffy paint. There is enough glue in the snow puffy paint for the accessories to stick where they are placed. Once you are happy with where all the snowman accessories have been placed leave the melted snowman to dry. Once dry he will remain puffy and a little spongy to touch. Daisy (aged 3) wanted to add snow to her snowman's hat and some twig legs as well as arms to her melted snowman. I love all the extra buttons she has added! We sprinkled a bit of extra snow glitter on top of our completed snowmen. Melted snowman art would look great displayed on the wall. As well as being a fun toddler activity it would make a fun class project, every melted snowman would be completely individual. The melted snowman printable pack below contains 3 versions of the snowman poem. It also includes a melted snowman writing frame where children can complete the sentence 'My snowman melted because....'. To get this melted snowman poem for FREE type in $0 and click on the 'I want this' box below. It may take a moment for the page to load so please be patient. After enjoying the melted snowman poem and making your melted snowman craft you might like to warm up with a hot chocolate from one of these hot chocolate recipes. You could even drink it from your own DIY snowman mug! I love this version of melted snowman art created on a canvas and shared on our facebook page by Vicki McKeown. 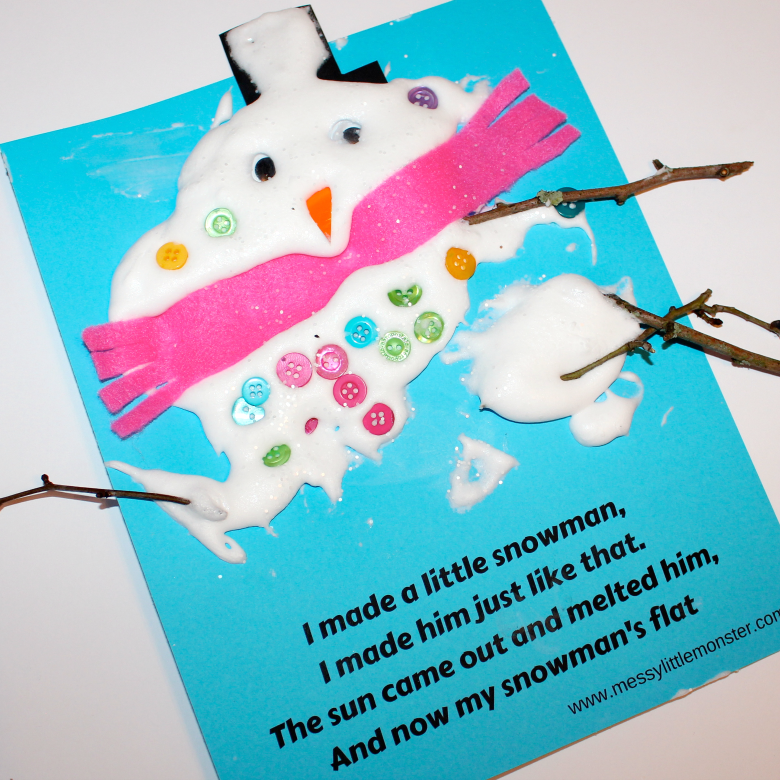 If you had fun making this melted snowman craft and poem you might enjoy some of our other snow activities for kids.